Using pivotal table you can calculate a large bunch of data in your worksheets. Most especially if your data in a single worksheet compose of mix product. Actually you categorize it according to its data set, example location, Order ID #, Product name, prices, product category, and date purchased. This arrangement of your set of data, I’m sure it is scrambled or unsorted and not easy to calculate. To solve this problem we can use the pivotal application of the Microsoft Office Excel 2007 version or Office excel 2010 or higher of this versions. And create your worksheets like for example, an order worksheets or any of your related worksheets you save in your computer. Open your worksheets of data. Click any cell of your worksheets. 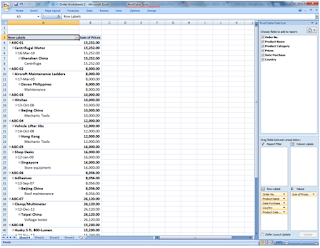 Then click Pivot table button left side position of the ribbon menu. Then click pivot table under in the list. It will open a dialogue box and it will select automatically the entire worskheet data. Then it will display a drag fields, you need to select and click a worksheet fields. Position top right side of your screen. It will automatically arrange and calculate the entire worksheet data with the sum of all prices display in the right side. Now you’re ready to sort the entire data. Click any cell in the total column. Click options menu tab and click sort button. It will display a small window, now select either smallest to largest or largest to smallest. Now its sorted together with the auto calculation of the grand total. Other task you need if you wanted to apply filter, change summary calculation, and apply two dimensional pivotal table in your worksheets. see you next post for this.